A Labor Day weekend tradition for enthusiasts across the country for over 45 years, RM Auctions’ Auburn Fall sale is held annually at the historic Auburn Auction Park in conjunction with Auburn, Indiana's famous ACD Festival! Click here for the ACD Festival's website and the current schedule of events and activities. 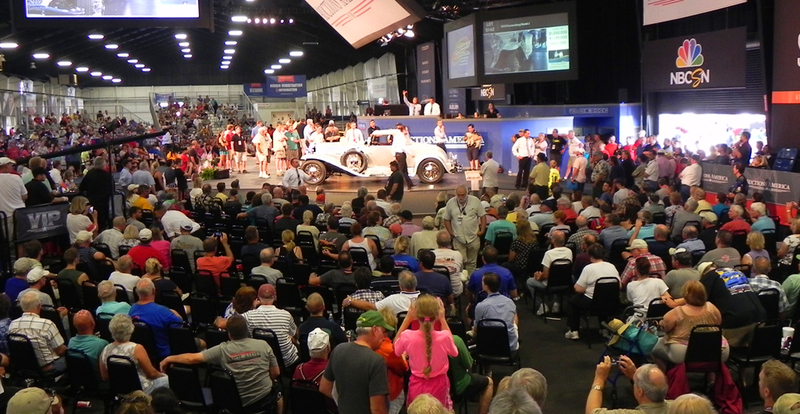 RM Auctions’ Auburn Fall auction sees more than 1,000 quality collector cars and an assortment of automobilia cross the podium during a four-day sale, ranging from American classics to European sports cars, Detroit muscle, hot rods, customs and modern collectibles. Beyond the dual-ring auction action, there’s always fun for the entire family, a FREE Kids Fun Zone; freestyle motocross shows throughout the day; helicopter rides; celebrity appearances and autograph signings; food vendors; a Swap Meet filled with hundreds of vendors selling just about anything; a Car Corral with over 250 cars ready to be bought; and a 50/50 draw where one lucky winner will take home half the pot! For current information, find this event listed on our calendar under our EVENTS tab.